“Theory and practice” seems to be a common phrase in project-based organizations these days, due to the academic nature of the work involved in business. This book chapter describes the authors’ vision for how project-based firms, such as architecture, engineering, and construction organizations, can reach organizational maturity in their respective practices. 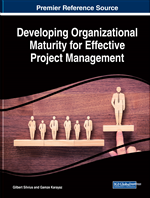 The chapter articulates the utility of project management maturity models as a form of maturity measurement and growth. Likert-type scales are mentioned as a tool used by consultants to assess organization parameters, as a way of quantifying certain data that can assist with necessary changes. The authors share recommendations in the technology arena, as well as theory research constructs that may help project-based practitioners and companies better understand and apply maturity strategies. These are some of the prime elements in use in these types of organizations, because they create value as well as survival enhancements.